Homepage > Blog > articles > Do You Have a Bulging Disc? Healthy discs are situated between the spinal vertebrae absorbing shock and aiding in flexibility and movement. Bulging discs, commonly appear in the lower back. 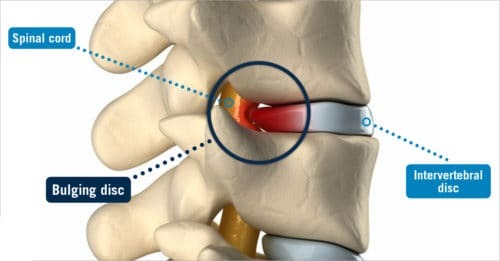 This happens when a weakened or compromised disc swells through a crevice in the spine, making its way outside of its normal position. This injury usually occurs slowly over a long period of time. As the disc moves, the liquid in the center begins to expand toward the weakest point in its casing. Interestingly, the bulging disc does not cause much pain itself, but it does cause pain after the disc eventually experiences a herniation. This means that the inner nucleus starts to leak through the damaged shell, causing further complications. What brings most patients into our chiropractic office in Brick NJ, is when the disc begins to place pressure on nearby nerves, causing severe and chronic pain. Now that we have a better understanding of bulging and herniated discs, let’s discuss the symptoms so you know what to look for. Pain or tingling in the neck, shoulders, arms, hands or fingers. Pain or tingling in the lower back, buttocks, legs, feet or toes. Pain in the upper back that radiates laterally. Always be sure to be checked if you experience these symptoms to either confirm a disc diagnosis or rule out other conditions. Wear and Tear: Our vertebrae and discs break down over time. When the discs are strained or the weight around them changes, they can begin to protrude. Degenerative Disc Disease: As we age, the discs on our spinal column begin to deteriorate and their water content decreases. These negative changes make the discs vulnerable to bulges and other complications. Certain factors such as, smoking, or inactivity can accelerate the disc corrosion. Bad posture: If your sitting, standing, or sleeping improperly, you could strain the back and neck, eventually leading to a possible bulging disc. Occupational hazard: If your job requires a lot of heavy lifting, bending, standing, or driving, you may be at a higher risk of developing a bulging disc. No medication, injections, or any other controlled substances needed for treatment. Chiropractic care is a holistic approach that may allow the body to heal itself. An experienced chiropractor may take X-rays of the area to help ensure an accurate diagnosis. Once a diagnosis is confirmed, your chiropractor may now determine a method of treatment. For example, he or she may gently stretch the spine to increase the space between the vertebrae. This method may be effective for relieving pressure on surrounding nerves. You chiropractor may also examine the entire spine, not just the affected area. This can help determine if joint dysfunction or restriction somewhere else along the spine is responsible for added stress and strain on the bulging disc. If found, her or she may apply gentle adjustments to help decrease symptoms and allow the body to heal itself! Chiropractic care for bulging discs may be a safe and effective path for relief. If you live in Brick, Toms River, or anywhere in Ocean County, the Back and Neck Center of Brick can help. Our team of Doctors have been treating patients for over 28 years! 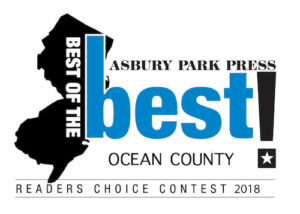 Come See Why the Back and Neck Center of Brick Has Been Voted Best Chiropractors in Ocean County 9 Years in a Row! From 2009 – 2017, by Readers of the Asbury Park Press. Next Next post: So You Have a Frozen Shoulder. Can Your Chiropractor Help?